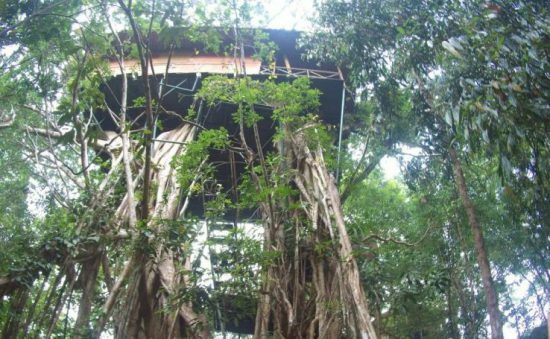 TREEHOUSES – JUST A GREEN DREAM? In the South-Western part of Germany you will find a wide mountainous area even called today Black Forest (Schwarzwald), and the name originates most probably from the Old Norse noun Myrkviðr (meaning mirky wood or black forest) as part of the Germanic-Scandinavian mythology Edda. 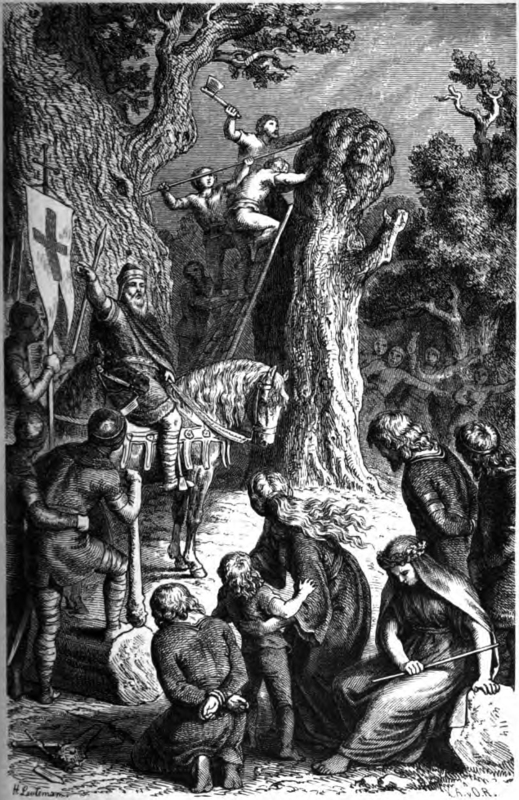 In this context the woodlands were a holy place for magic rituals around the all-connecting world tree Yggdrasil. 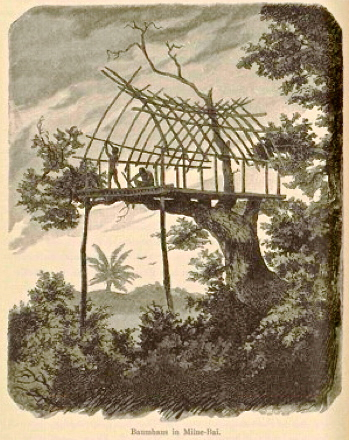 The German tales collected and published by Gebrüder Grimm in the 19th century tell us a lot of stories regarding these sometimes quite bizarre forest sites, while the author J. R. R. Tolkien adopted this dense and green place much more recently as the gloomy Mirkwood, a Northern jungle full of primeval mysteries. Our much older ancestors, the monkeys, once did a new thing. Hitherto there had been the earth-bound animals with legs and the air-borne animals with wings. The monkeys left the ground without riding the air and made the trees their habitation, and this was incorporated in our genetic codes while human children do like normally very much climbing or housing on trees as a self-evident game. So the green trees and the wide forests mean certainly our original (mostly previous) homeland here on Earth. Therefore it is also not astonishing that Buddha has only attained enlightenment under a tree, the sacred fig named Bodhi. Such natural mythological places and symbols were destroyed everywhere in Europe as part of a violent missioning Christian crusade starting in the 6th century which completely ignored the fact that plants and trees are living much longer and obviously in greater diversity than our species on this planet and deserve our full respect. Nowadays – as part of a recollection to nature as a value in itself which is not at all a romantic question – modern architecture discovers again trees as an integral part of constructing houses worldwide. This development gets most visible at the two Bosco Verticale towers at Milan where real trees and bushes have been set on its balconies with the aim to create one hectare of forest as part of a modern appartment building in the very centre of a densely populated big town. But here the basic materials of construction remain concrete and glass, so the trees and bushes resemble more or less just a green attachment, a planted facade. 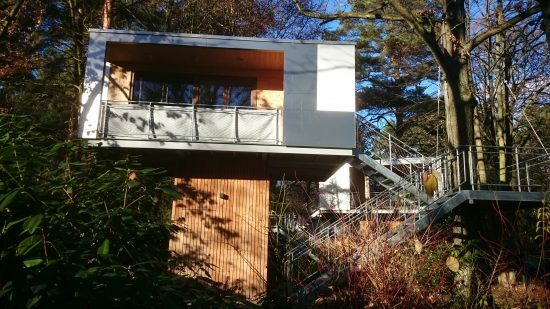 So I was really enthusiastic when I stumbled over the information some time ago that urban treehouses are existing not far away in my town, because in the concept of such buildings trees are standing in the centre of design and creation. A treehouse in a big city like Berlin, that sounds quite strange first of all. 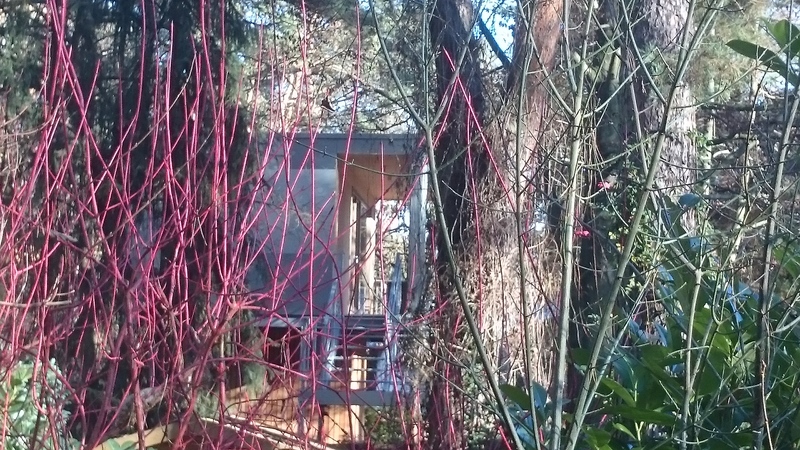 But for the architects & builders of the Urban Treehouse-project this is the most relevant part of their conceptual design in order to connect nature and a modern kind of urban living on a high level. 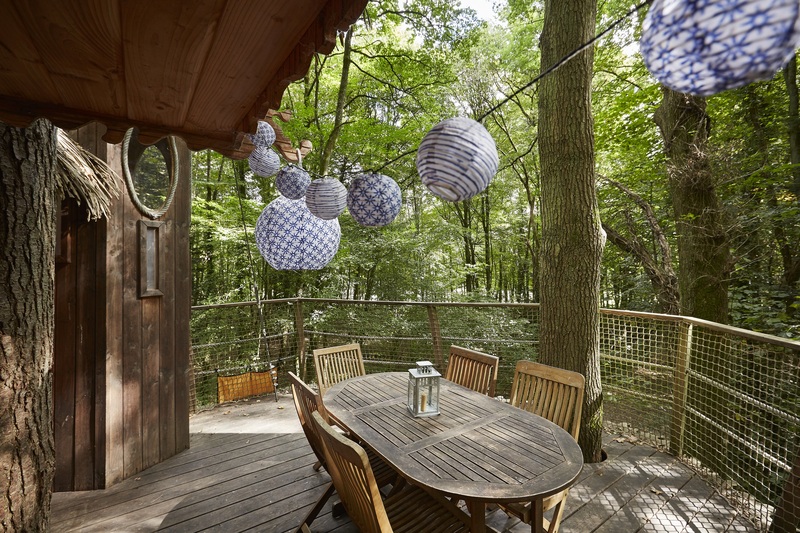 So they have built two of these small treehouses on a premise directly situated at Berlin’s great forest Grunewald and not far away from the nice lake Krumme Lanke at the district of Zehlendorf. If you intend to go somewhere in the city centre, the next subway station can be reached from there easily and in short-time. So both can be appreciated when living in these houses: the joys of nature and the diverse advantages of a European capital. Hence, this is a mere private project which can be only used by family members for a very delightful stay someday. 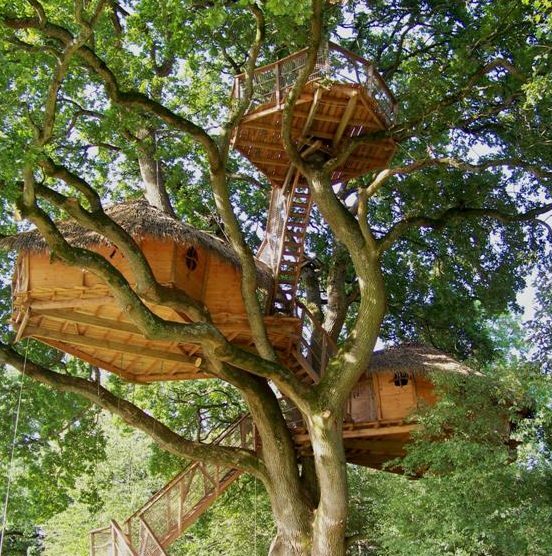 As a part of a more adventure focused tourism treehouse hotels in Europe are quite popular in Germany and France, few others can be also found in Austria, Switzerland, Italy, Great Britain and Turkey – in total at least 50 rural sites all around in Europe. The accomodation prices are quite often comparable to a stay in a 5-star-hotel, as they definitely offer some kind of deluxe today, a place for dreaming like a bird. At Cabanes de la Grande Noe (being situated in the Normandy countryside of France) six different houses can be rented for 2 or more people on a family run domain. All of them are built merely with wood around or in the trees, such reflecting the traditional way of constructing these kind of houses. So here you have the possibility to experience the rural and puristic treehouse feeling, but with breakfast served and brought to the treehouse each morning – what a luxury wilderness. If you possibly intend to build a treehouse sometimes lateron just for yourself, the following book will be in any case helpful and animating: Be in a Treehouse: Design / Construction / Inspiration by Pete Nelson also available in German Die wunderbare Welt der Baumhäuser: Design – Konstruktion – Inspiration, Pete Nelson. Love it. Didn’t we all climb as high as we could in trees when we were children? I missed the tree-house in Berlin when I was there. Will have to come back. Oh yes, these modern treehouses in my town have also astonished me very much! Not many guests though then except us there this January sleeping in a treehouse, but in summer it is just too full. It’s not cheap however but an adventure like in a tale! These people also produce treehouses at this premises and export them worldwide like to Asia.